As you probably know, my youngest little guy is six years old. We have been reading lots and lots of Junie B. Jones books. If you're in kindergarten or first grade you totally know who she is. Anyway, they are really funny books and last night Junie said something in her book that I can't get out of my head. "Glitter can turn your whole day around." I guess officially, the quote would be by Barbara Parks since she is the author of the book. Either way, I do love the quote and I do wish I was able to get glitter glaze for my beads. I am a sucker for shiny things. 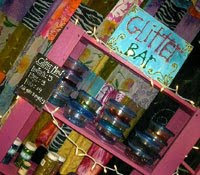 Above is a picture of the Glitter Bar at my friend Dori's Dreaming Bear Studio. If you are ever in Marion Iowa, you can stop by and use all types of the stuff on your art projects. How fun!